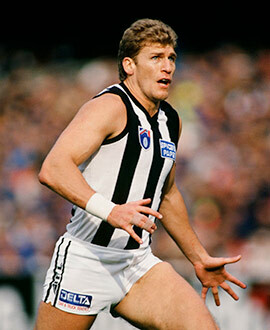 A talented key position player who made his name as one of the 20 men who took Collingwood to premiership glory in 1990. Christian was recruited from East Perth and made an immediate impression at Victoria Park, making his debut alongside six other first-timers against Sydney in round one of 1987. Christian missed only four more games for the season, mostly in defence, but went forward to kick three goals from six scoring shots against the Eagles in his native state. He was a regular selection in defence over the three years that followed, but missed the Qualifying Final draw against the Eagles in 1990 He was selected for the Replay and made good on his chance, earning 24 disposals, a goal and five hitouts as a makeshift ruckman. He played an important role in the Grand Final win over Essendon with 19 disposals and famously kicked seven goals against the same opposition just one week later during an exhibition match in London. Injuries hampered his progress in the years following the premiership but he still remained a regular when fit and firing. Christian bowed out at the end of 1995, but still featured in the famed ANZAC Day draw against Essendon and remained a popular clubman to the end, winning the Darren Millane Memorial Trophy in his final year. He was made a Life Member in 2001 and he was a key member of Channel 10’s football coverage from 2002 until 2011. He also co-hosted the first season of Collingwood’s television program The Club in 2012.